Prowise presents the latest generation personal devices. The Prowise Chromebooks, Prowise All-in-One PCs and Prowise EduBook 360 are better aligned with the needs of the education sector than ever before. Adding devices to the classroom realises personalised education and an active class. Prowise also develops the software, ensuring that the devices completely fit into the classroom: Prowise Presenter. As Google for Education Partner in the Benelux, Prowise launches the new Chromebook EduLine series. Prowise is one of the only businesses in he world that works together with Google in producing Chromebooks. Due to its speed, powerful battery, Android apps, HD camera, automatic updates and 360º rotating touchscreen (EduLine 360), the devices can be deployed in the classroom in many different ways. The Chromebooks from the EduLine series comply with high quality standards, are suitable for use in the modern classroom and have an incredible 3-year warranty. The Chromebook EduLine 360 is equipped with 4GB RAM/32GB storage and has a 360º rotating screen. Use it as a laptop to write essays together and fold it over to transform it into a tablet to play educational games or read long texts. The Chromebook EduLine does not have a 360º rotating display and is equipped with 4GB RAM/16GB storage. The Prowise All-in-One PC is set to play a key role in the classroom. The 21.5″ LED screen delivers up to six hours of superior performance thanks to the powerful long-lasting battery. Thanks to the 10-point multi-touch touchscreen, the All-in-One PC is perfectly suited to numerous students working with or around it. Teach in PC Mode, divide students into small groups and work in tablet mode or allow someone to work on exercises independently in a quiet corner of the classroom. 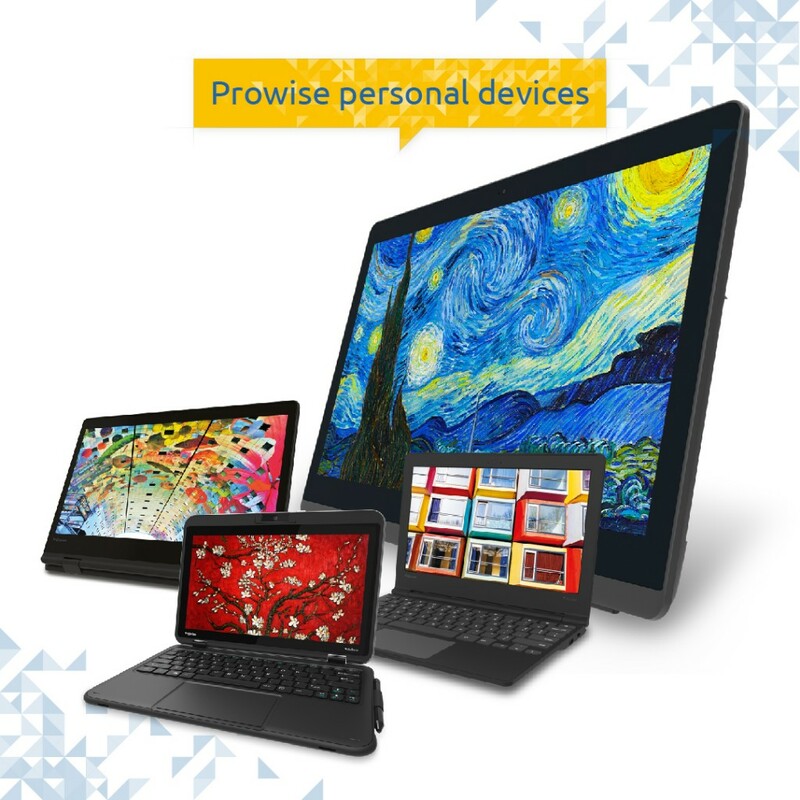 There are more functionalities that turn the Prowise All-in-One PC into a versatile device for use at school. The two megapixel camera and microphone guarantee that students can get started with recording film clips, Skype conversations or interactive games. The clever webcam cover means you do not have to be concerned about undesirable onlookers. You can rest assured by sliding the cover over the camera. The Privacy Verified certificate shows that you can trust that your personal data is safe with us. The Prowise All-in-One PC is available in two models: the Intel Pentium and Intel Core i5. The Prowise Edubook 360 is a powerful notebook, equipped with Windows 10, touchscreen and Windows Ink pen. The device always offers the right mode to work with. Due to its 360º tilting touchscreen you can transform it from laptop to tablet and anything in between. This was you the tablet can be deployed flexibly in the classroom. De Prowise EduBook 360 is equipped with a Windows Ink pen. Students can write with the greatest precision, practise their writing skills and make detailed drawings. The 180º rotating camera function is new, and you can now make photos and videos from the front and rear side of the device. Thanks to the innovative rotating design of the camera, you can discover many new educational options: you can record the lesson while you are taking notes.